The more we rely on online mapping to tell us the truth, the more it can be used to deceive us. 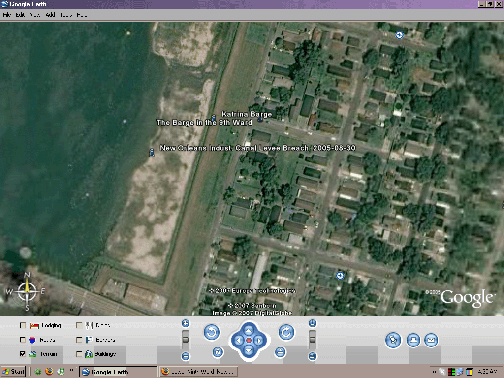 Google goes back to pre-Katrina maps, with the Lower 9th Ward restored. Google Earth states that it uses whatever data that the data suppliers give them. But they certainly modify data based on government requests. So why not obtain “2007” data that actually is from “2007”? My pal Dave Tulloch delves into the potential of empowerment and greater participation through online mapping. He also points to the February 2006 cover article in the journal Nature, Mapping for the Masses. Online mapping is the current killer app. What Dave and Nature leave out, probably because of space limitations, is the concurrent need for physical participation. We’ll have many new virtual tools to allow us to create individual empowerment (of course, it may be the appearance of empowerment). But it also can isolate us from members of our own geographic communities. That’s no substitute for the power of the group when it derives from people getting together in the same physical place to work out their differences and come to shared solutions. The Dimension 3D Printing Group, a business unit of Stratasys, Inc., reports that Mitekgruppen, a Swedish design firm hired to create a 3D model of the city of Stockholm, Sweden, completed the project in a fraction of the normal time by using a Dimension 3D printer and Google Earth. To construct the Stockholm model, Mitekgruppen used aerial photos and drawings to create the city’s buildings in a computer aided design (CAD) program. Where aerial photos and drawings weren’t available, designers relied on Google Earth to prepare these CAD files for the 3D printer. The CAD files were then sent to the 3D printer to produce models of Stockholm’s buildings. The finished building replicas where then positioned, secured and hand painted along with other landscape features including bridges, cars, boats trains and trees. Other companies have used the Dimension 3D printer to create neighborhood models within cities. Gordon Ingram Associates (GIA), a U.K. based lighting consultancy firm, used a Dimension to generate scaled 3D models of areas in central London, allowing interested parties the ability to witness the effects of light on the buildings in the cityscape. Here’s a description of 3D printing. This would be an awesome tool for conservation projects in developing countries, the technological version of participatory 3D modelling. This is an interesting twist. Instead of making Google Earth into Second Life, why not make a virtual version of Google Earth inside of Second Life? Second Life is an alternative 3D universe (or Metaverse) which lets you have an alternate version of yourself and explore a different 3D world. Josh Knauer has developed a virtual version of a Google Earth like interface which he calls GeoGlobe. He announced GeoGlobe on his blog here. You need to have Second Life installed, and then follow this special link to teleport yourself into Second Life to let you view content such as Google Earth’s KML placemarks or GeoRSS. Never thought I’d see recursion in virtuality. Question is, while the Second Life avatars are wandering GeoGlobe, will they be able to bring up Google Earth on their virtual laptops or handhelds? From time to time, I’ll write about opportunities for information technology to advance community development. How do you encourage local economic development when so much of your populace is excluded from mainstream financial institutions? Kenya has become the first country to allow cell phone users to send cash to other phone users via text messages. Helveta Ltd, a UK company, has developed an innovative software application called CIEarth, which is designed to enable accurate forest inventory and community resource mapping. The software is loaded onto a ruggedised handheld computer, data points are recorded via the touch-sensitive computer screen and the position of each data point is mapped according to its GPS location. Appalachian Voices uses Google Earth to highlight the destruction of its mountain tops. The first time I flew over southern West Virginia and saw mountaintop removal coal mining from the air, I knew that if everyone could see what I had seenâ€”mountain after mountain blown up and then dumped into streams in the neighboring valleysâ€”they would think twice about where their electricity came from the next time they flipped a light switch. That’s why we at Appalachian Voices, and our partner groups, created the National Memorial for the Mountains, using Google Earth to tell the stories of more than 470 mountains that have been lost, as the centerpiece of our website www.iLoveMountains.org. We never imagined that those stories would now be available to over 200 million people as part of the latest release of featured content in Google Earth. GPS does not work underwater-the radio signals on which it depends cannot pass through water. So submariners have yet to benefit from the revolution in navigation that it allows. Now engineers working for the US Office of Naval Research think they have found a simple way to let submarines and divers get an accurate GPS fix. A base station is tethered to the sea bed at known depth and known GPS location. A submersible anywhere in the area sends out a sonar request pulse to which the base station replies with a signal which gives its GPS position and depth as well as the bearing angle from which the submersibleâ€™s request arrived. The submersible then uses its own depth, which is easily measured, plus the round trip pulse time and the bearing angle sent by the base, to calculate its own position. Simple. Presumably the methods and apparatus will become commercially available. It’ll be a tremendous boon to oceanographic and marine research, which have had to rely on movable buoys or losable radio transmitters. It also has potential for conservation research, for example, to locate and map changes in the seabed and coral reefs. Mongabay, a conservation and environmental news aggregator, reports on the efforts of the Amazon Conservation Team to assist Amazon natives in using Google Earth and global positioning systems (GPS) to protect the rainforest. Once the Indians pinpoint suspect areas using Google Earth, they note the coordinates, then go on foot patrol to investigate further or mark the spot for future airplane flyovers, where five to six Indians go up with government officials to scout for illegal incursions. Van Roosmalen says that without the aid of satellite imagery, flyovers can be of limited effectiveness due to the extent of the forest. Robert Rundstrom 1991 Mapping, Postmodernism, Indigenous People and the Changing Direction of North American Cartography. Cartographica 28(2): 1-12. Robert Rundstrom 1995 GIS, Indigenous Peoples, and Epistemological Diversity. Cartography and Geographic Information Systems 22(1): 45-57. Nonetheless, there’s ample evidence that advanced spatial technologies are increasingly becoming an appropriate technology to counter the mining companies, preserve habitat and a community’s way of life, advocate for land claims, allow native people to make maps using their own symbols, and enable and values to be transmitted from generation to generation. GIS, GPS and RS (remote sensing) are becoming the “killer app” for the rest of the world too. The NYTimes reports that, perhaps as a result of successful movies like An Inconvenient Truth, a spate of movies are coming out in which The Earth is a victim. In some of them, The Environment gets to take its revenge. The Environment is even showing up to confront cartoon characters. In â€œTransformers,â€ which DreamWorks and Paramount Pictures are scheduled to release on July 4, robot warriors escape a planet laid waste by civil war, only to arrive on Earth as it faces similar devastation. Mr. Orci added that he had seen a number of development projects recently in which the monster was created by environmental change. An interesting application of simple economics is present on every corner in Buenos Aires and many other South American cities. A computer (‘machina’, they call them) with internet service is often too expensive for the average family to purchase. So, over the last decade, the stores that host a handfull of telephone booths, or ‘locutorios’, have also introduced pay-by-the-quarter-hour computers. Children are the most frequent patrons of these locations by far and away. Chatting is exceedingly popular; videogames, less so. In my estimation, some kids are blowing half of their weekly allowances on internet hours. Still, it is not likely that they would save enough to buy a computer by setting all of their internet pesos aside and opting for soccer instead. Plus, the social currency of chatting is irresistible to many, judging by the glazed eyeballs. You are currently browsing the Computers, Society, and Nature blog archives for March, 2007.